Making space for a new baby can be difficult, especially if there's hardly enough room for you and your partner. Fortunately, there are some tricks to create more space. If possible, choose items that offer more than one purpose or offer extra storage space. This will save you space and allow you to get more for your money. These can serve as a changing station, play station, and napper in one. What better way to lug all your diapers around than with a travel-friendly changing bed? The foldable changing table can also be used at home. A clip-on highchair can clip onto the edge of a table and can be taken with you wherever you go, so you don't have to find space for a large highchair. You can attach rollers to your crib or storage units, so you can easily move them around to maximize space. A toy hammock can keep toys organized and out of the way. Some mini cribs can be converted into twin beds for extra space and a better value once your baby is ready to graduate to a real bed. If you have suitcases that aren't being actively used, take advantage of the storage space by hiding baby items that aren't needed at the moment, like clothing that your baby can't fit into yet. When there isn't a lot of room on the ground, you need to start thinking vertically. Hang tiers of shelves to take advantage of wall space or invest in tiered stands to store baby supplies. You can even make a makeshift closet by hanging a bar on the wall to hang your baby's clothes or toys. These over-the-door organizers can store everything from baby essentials to toys (or anything else that needs to be kept off the floor). No need to get a bulky stroller when a stroller hanger can help with storage space. Not everyone has an extra bedroom reserved just for the new baby, but how about a closet? If you can clear out a closet, you can easily store all the baby essentials by taking advantage of every inch of free space. You can also convert the closet into a small nursery by removing the door and replacing it with curtains. "Closet nurseries" are becoming more popular, so you can find endless decorating ideas online. 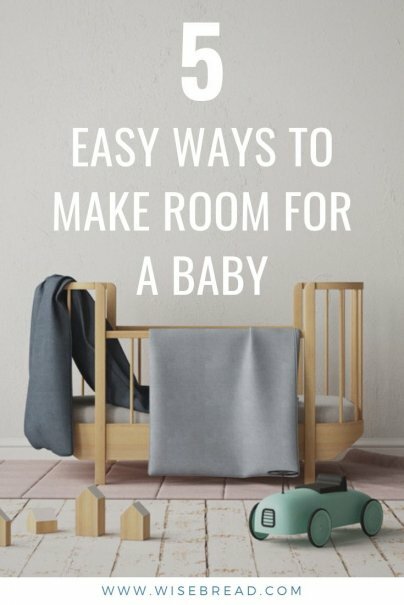 This will allow you to have your new baby in the same room, while still maintaining privacy.